His skin is like a marble table. Darker spots and streaks cover his forearms: some thin, some thick and some going as high as his biceps. There are eight on his left and 15 on his right. All are burn marks from being a little careless at the oven during the lunch rush hour. Though they sting in the moment, they look worse than they actually feel. 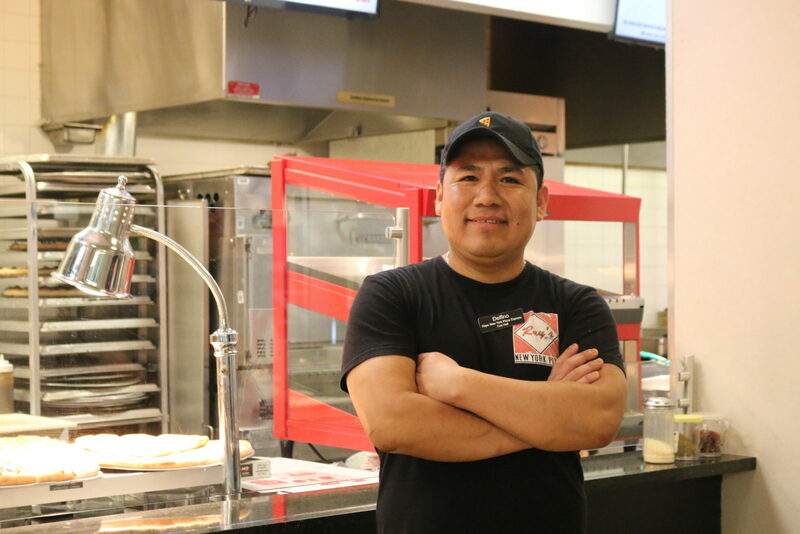 Supervisor of Ray’s New York Pizza at Cox Hall Delfino Cruz overcame the difficulties of leaving home to support his family in Mexico. The 37-year-old food service veteran never thought that he would leave his native country for the restaurant business, but he has worked in the industry for 12 years now. “I’m just a little more clumsy,” said Delfino Cruz with a chuckle, explaining his burns. His most recent burn on the upper portion of his right forearm, from last week, looks fresh. A glance at his co-workers, Jose Cruz and Rosalina Aguilar, confirms his clumsiness — their arms are unscathed. Standing at 5 feet 7 inches tall, give or take an inch, Delfino Cruz and Aguilar use an industrial oven about level with their stomachs. Jose Cruz, standing about 6 feet tall, uses a taller oven to slide pizza from the tray to the oven, and notes Delfino Cruz’s height as a possible reason for his burns. In fact, when Delfino Cruz once attempted to use the top oven, his bicep touched the oven and he immediately pulled his arm back. There lies his widest burn. However, Delfino Cruz seems unconcerned about most of his burns, and admits that he often forgets to apply ointment to them even though he knows he should. A customer can see how Delfino Cruz gets burned so easily: he slides the steel tray under the dough, throws the pizza into the oven and closes the oven all in one swift motion. It all happens so quickly that it becomes clear that he values customer service and speed more than personal safety. Delfino Cruz appears to be at Cox Hall for all of its operating hours, working from 9 a.m. to 9 p.m. every weekday except Friday when he leaves at 3 p.m. From Mondays to Thursdays, he goes to sleep around midnight and wakes up around 7:30 a.m to arrive first at Ray’s. By 9:30 a.m., he prepares the dough. Jose Cruz and Aguilar come in around 11 a.m. every day, but both leave at least two hours before Delfino Cruz. As Ray’s Pizza closes at Cox Hall, Delfino Cruz is the last man cleaning surfaces, washing pizza cutters and shutting down ovens. Before he leaves, he offers leftover pizza to employees at neighboring restaurants at Cox Hall; due to food safety regulations, any leftovers must be thrown away. Though the chaos of Cox Hall’s lunch rush prevents much more than curt business transactions between employees and customers, Delfino Cruz is one of few employees who checks in with and greets customers, asking them about their days and giving them a chance to reflect on how they are feeling. Delfino Cruz recounted an encounter with a nurse who had ordered a slice of pepperoni pizza and mistakenly thought that garlic knots came as a side. After realizing the nurse’s misunderstanding, Delfino Cruz held a serving of three garlic knots for free. “Just know you have to pay for them next time,” he told her. He snuck the garlic knots into the pizza box, smoothly pretending that the interaction didn’t happen, and immediately turned to serve the next customer. The nurse nodded understandingly, apologized again and turned around to walk to the cash register. Delfino Cruz also extends his kindness to fellow employees at Cox Hall. Even while already working around 56 hours weekly at Ray’s, he sometimes serves customers at Baba Mediterranean Grill when Baba employee Kimberly Brown steps away for mealtimes or breaks. When Delfino Cruz and Aguilar work behind the food stand, they operate as a seamless team, communicating in Spanish. Both employees fold and heat the pizza to make it look appetizing, but take turns at the counter; while one serves the customers and labels boxes, the other cleans pizza cutters and wipes the surfaces. Hard work comes naturally to Delfino Cruz. He recalled his early childhood and adolescence, when he worked on a farm with his father in Guerrero,Mexico. He wanted to study biology in school, but his family couldn’t afford it. His mother passed away when he was only 4 years old, and growing up in a single-parent household meant he worked hard to support his family. In 2000, when Delfino Cruz was just 16 years old, he moved to Mexico City to work at a hardware store. Family, he said, is of utmost importance to him. In 2006, Delfino Cruz moved to Atlanta to work in an Italian restaurant to attain a better life and make more money for his family. He said he’s stuck with the food industry because he enjoys the workflow and camaraderie. To this day, he still sends money back home to help his father with finances. When Delfino Cruz first came to the U.S., he knew no English. The language barrier definitely proved a struggle. “When you go to another country and don’t speak the language, everything is hard,” Delfino Cruz said. Over the weekend, when not working, Delfino Cruz spend his time relaxing. On Fridays, he loves to dance to country music and bowl. Over the years, he’s made tremendous strides in both, now averaging a score of 150 in bowling. On rare occasions, he splurges his leftover money on travel. His favorite destinations are Miami, Chicago and Las Vegas. He considers his home to be Atlanta, and he frequently visits his sister and her son, who live in Atlanta as well. Due to his demanding work schedule, he has not visited his father in Mexico since leaving the country 12 years ago — something he hopes to do soon. Although he enjoys his current job, he dreams of someday becoming a flight attendant and traveling, hoping that his bilinguality better qualifies him for the job. Although he hasn’t taken the steps to do so, he has friends that work at Delta. He also dreams of buying a house and laying his roots close to Atlanta. Atlanta is the only place he’s lived in America, and he prefers to stay close to his sister and her son, his only family in the U.S.